3 Beds 2 / 0 / 1 Baths 2,180 Sq. ft. Description: Light and bright dr horton model in huning ranch planned community. Lots of elbow room with 2 living areas and a loft, 2,180 sq ft, 3 bedrooms and 2- 1/2 baths. Stay cozy with the gas log fireplaces in the great room and master suite. Kitchen with island and pantry. The covered patio is a great place to relax or entertain in the walled backyard. Refrigerated air conditioning will keep you cool all summer long. Planned community includes parks, landscaped walking trails, and a dog park. Walking distance to sundance elementary and convenient to walmart, home depot, lowes, shopping, restaurants, theater and all city conveniences. 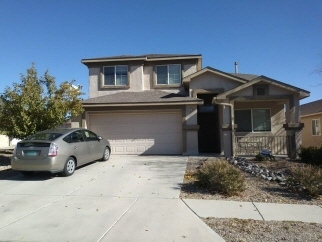 Great location with easy access to i-25 and minutes to albuquerque.